Windflower (Anemone nemerosa): growing, planting, caring. A white-flowered anemone - and a great groundcover. 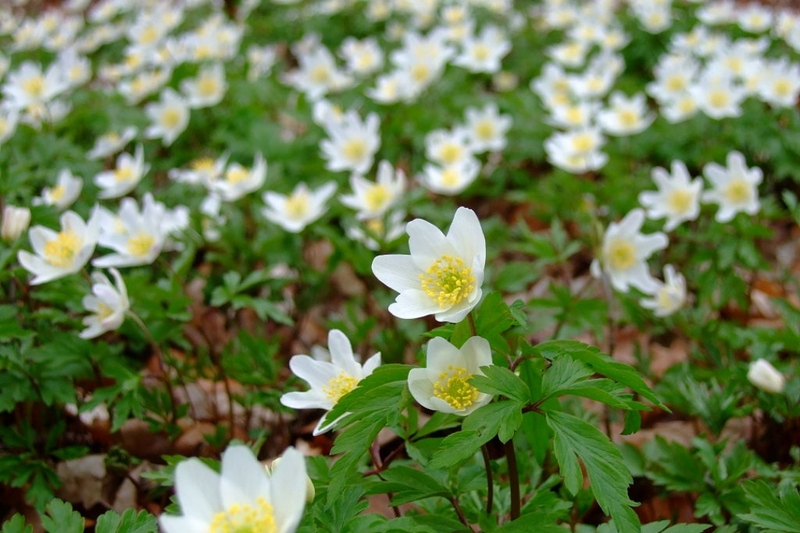 Anemone nemorosa is an early-spring flowering herbaceous perennial plant growing 5–15 centimetres (2–6 in) tall, native to Europe. Other names include wood anemone, thimbleweed or smell fox, an allusion to the musky smell of the leaves. Anemones are flowering plants of the Renonculaceae family of temperate zones of both hemispheres. The word comes from the Greek and means "daughter of the wind", because the wind carries its feathery seeds at great distances! Woody anemones are perennial with fibrous strains and a creeping woody base, with rounded to deeply divided oval green leaves. In spring they carry white flowers with five tepals, semi-pendent. Plant the anemones in autumn, in a dry soil well prepared (unpacked with the spade, then scratched to break the clods), with humus, well drained, in the sun or in semi-shade, except for Anemone nemerosa, that you will plant in moist soil, rich in humus, in semi-shade. Pour half a watering can per plant. Water the anemones without unnecessarily wetting the foliage in the morning or evening. Pour until the water takes some time to be absorbed by the soil. In summer, these anemones can suffer from drought if they are in full sun, so water them from time to time. Weed the first years. When the anemones are well established after several years, and extend, do not hesitate to cut the roots which invade the neighboring plants with a spade. The easiest method is by division in April. Slice roots accompanied with leaves with a sharp spade, and replant. Mulch in November and April to limit evaporation in the summer and fertilize and protect the plant from cold during the winter. Prefer a mulch in the fall, and mulch or compost in June.